These days, I think you’ll have trouble earning that much on an investment. You’d need to earn between 17% and 18% annually on your money, which is a little unrealistic. Investing is something done over time – you don’t want to just put $3,000 into an account and never look at it again. Instead, you should open an account with that $3,000, and then add a little more automatically each month so it can grow. So take a look at your current situation. Do you have at least 6-9 months in an emergency fund? Is your high-interest debt paid off? If you answered “yes” to these questions, you can to consider putting that $3,000 into a retirement account like a 401(k) where the money can grow tax-deferred until retirement — if you have one at work — or a Roth IRA where the money can grow tax free forever. Your underlying question though, is in what do you invest the money in order to make it grow over that 30-year time period. I’d suggest a target-date retirement fund. This is a mutual fund managed based on your retirement date (you choose a fund with the date in the title that is approximately when you are going to retire, 2030, for example or 2040). Then the manager of that fund takes fewer and fewer risks as you get older so that if the market takes a dive right before you retire, you’re not in such a precarious position. For most people this works much better than trying to pick a few stocks yourself. 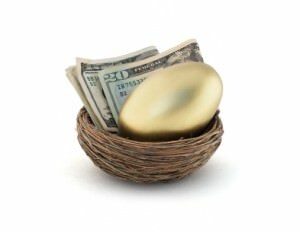 The folks at the Employee Benefit Research Institute recently analyzed 24 million 401(k) retirement accounts. They found that 21 percent of people 10 years away from retirement had 90 percent of their money in stocks. That was way too risky and when the markets cratered they got creamed. The people who’d gone the target-date fund route had 51 percent of their money in stocks, 10 years away from retirement. The market collapse hurt them, but not nearly as much.